First there was Woodstock. Then there was Lollapalooza. Now there’s the Edisto Island Bluegrass Festival. On October 26 Point of Pines Plantation will transform into a concert venue the likes of this island has never seen before. Several national and local bands will play bluegrass and Americana music during the family-friendly festival. The bands playing include headliners The Lonesome River Band, Shovels and Rope, and Frank Solivan and Dirty Kitchen. 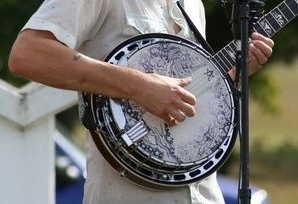 These bands are all leaders on the bluegrass music scene and have achieved success and popularity within the genre. Lowcountry bands will also take to the stage and include The Bluestone Ramblers, Southern Flavor Bluegrass, Blue Plantation, and Flatt City. Each of these bands is popular locally and within the region for their acoustic music and performances. In addition to the music, the festival will feature local food vendors, craft beer and wine, and vendors selling souvenirs so that those in attendance can prove they were really at Edisto’s first Bluegrass Festival. The food will be provided by local establishments like Flowers’ Seafood, McConkey’s Jungle Shack, and Po Pigs Bo-B-Q. Food vendors from off of the island will also be present. Craft beer and wine, along with soft drinks and sweet tea, will also be available for purchase at the event. While having a good time with the family is one of the main things the festival is all about, proceeds generated from the festival will go toward preserving everything visitors and locals love about the island. The proceeds will go to the Edisto Island Preservation Alliance and will help support the non-profit organization’s projects, which include the Edisto Island National Scenic Byway. Events like the Bluegrass Festival help to ensure that future generations have the ability to appreciate the natural beauty of the island the same way we all do today. To really drive home the point of preservation efforts, the festival will take place on the grounds of Point of Pines Plantation. This plantation has been around since the Europeans first colonized the island and has a long history on the island. The stage where the musicians will perform is going to be located near the ruins of the first building ever built on the grounds. The scenic setting of the festival also helps to remind those in attendance of what kind of place they are helping to protect. Point of Pines Plantation is bordered by the North Edisto River, maritime forests, and marshlands. It’s not uncommon to see deer, herons, egrets, and a host of other animals out on the grounds or in the nearby marsh at any given point in the day. To have a good time and do your part to help preserve the Edisto way of life visit www.edistoislandbluegrass.com to find more information about the festival and to purchase tickets.